I love the sweetness of roasted baby carrots and always have them in my refrigerator to put on salads or eat as snacks. I decided I needed to create a new sweet bread recipe using roasted carrots instead of shredded, uncooked carrots as most carrot bread or muffin recipes call for. I puréed them in my Cuisinart to give them a texture similar to canned pumpkin, which keeps the bread moist and spongy. And, I couldn't help but add shredded coconut and raisins. The result was delicious! I love how this recipe turned out and it will now be in my regular baking rotation. Another bonus is that the loaves look gorgeous with the browned coconut on top. Hope you enjoy as much as I did! To roast baby carrots, line baking sheet with foil and arrange carrots in a single layer and coat with olive oil spray. Roast at 425° for 35-45 minutes until tender and browned. Cool completely and then purée in Cuisinart. Turn oven down to 350°. Whisk or sift together flour, salt, baking soda, cinnamon, ginger & cloves in a medium mixing bowl. Set aside. Using a Kitchenaid mixer or hand mixer, combine sugar, carrot purée, eggs, oil, applesauce, and sour cream; mix well. Stir in raisins and shredded coconut. Pour batter into two 8" bread loaf pans coated with canola oil spray; sprinkle tops with shredded coconut. 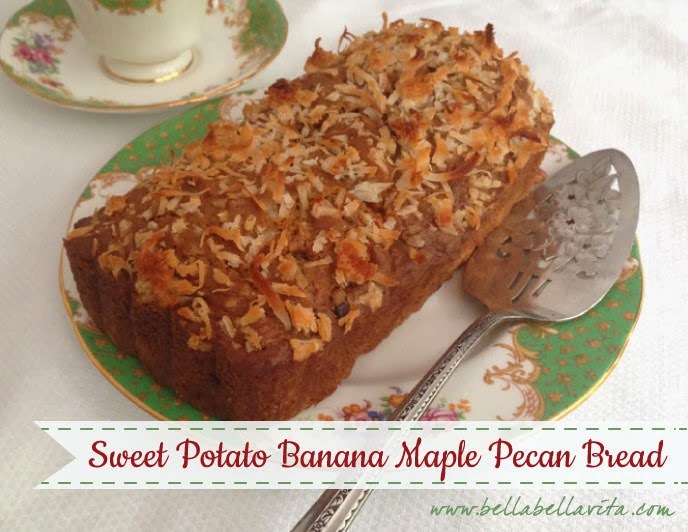 Don't miss my Pumpkin Bread and Maple Banana Bread recipes from previous posts!